by ~ December 29th, 2009. Filed under: Gambling, Poker and life. When I was in fifth grade marbles were a big thing in our school. But we didn’t have the ordinary marble games where you chase each other around by trying to hit your opponent’s marble, or trying to knock other marbles out of a circle that’s drawn in the dirt. Our marble gaming area was like a casino. Along one section of brick school wall we dug small pits in the dirt. When someone wanted to set up shop they would claim one of the pits by putting a marble or two on the edge of the little pit, draw a line somewhere out front, and begin the huckstering. “Hit it in, you get five!”, or with one of the big marbles, which we called “cobs”, you could just put the cob on the edge and offer “Hit it in, you get it!”, since cobs were generally considered to be more valuable than regular “shooters”. Then the unspoken rules were that you put your hand on the ground behind the line and shot one of your marbles. If you missed, your marble went into the pit and ownership of that marble went to the person running the pit. If you were successful and hit the target marble into the pit, you claimed the prize that was being offered. Just like a free market gambling casino. People offering the challenges gave odds, like 6 -1 or 5-1, and these odds would be relative to the level of difficulty. For example for higher odds the shooting line might be drawn further away than for the lower odds. Or there might be variations in the physical aspects, such bumpy dirt in front of the pit making navigation difficult, or pressing the target into the dirt slightly increasing the difficulty of dislodging the target and knocking it into the hole, or putting the target marble a few inches in front of the lip of the pit instead of having it right on the edge which also made it more difficult to be able to knock the target into the hole. Or sometimes they would use “steelies” as targets; marbles made of steel rather than glass which would be heavier and more difficult to move when hit with a regular glass marble. Or use tiny marbles, which we called “peewees” as the target. Potential customers (other 9-12 year old boys) would wander the gaming area, evaluating the odds and potential rewards in relation to the level of difficulty. Games that seemed unreasonable in terms of risk/reward would be deemed a “gyp” and few customers would be interested. Ones that seemed fair and interesting would have shooter after shooter lined up waiting for a turn. Most of us played both roles at various times. Sometimes we’d set up a game and advertise our challenge. Other times, especially if the wall was busy, we’d wander in front of the gaming area looking for good opportunities. In the fifth grade I was marble champion at our school. I turned a bag or so of marbles into a one-gallon ice cream bucket full of marbles by the end of the school year. I’d select 6-10 marbles to take with me in the morning and return after having played at recess and for a while after-school with my pockets full. The marbles themselves didn’t matter to me like they did with some kids. 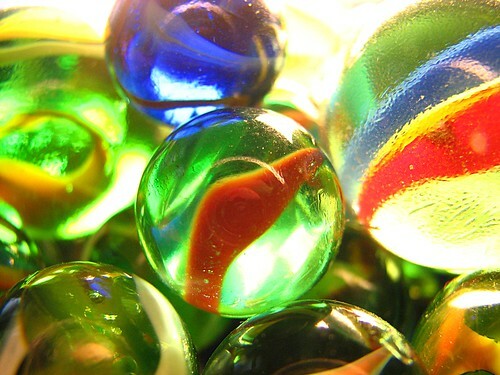 Marbles were a commodity or a currency so as long as they weren’t chipped so I could use them to shoot I didn’t care what color they were or what patterns they had inside. My advantage; I had the strongest and most accurate thumb. If the difficulty was hitting a semi-buried or heavy steelie into the hole, that wasn’t a problem for my thumb strength. If the difficulty was bumpy terrain, I was able to shoot hard enough that the marble never touched the ground, flying from my hand where my back fingers touched the ground but the front ones were lifted to get the needed angle, arcing slightly and dropping onto the front of the target to dislodge it. If it was difficult to hit, like a peewee or a marble placed further ahead of the pit, my accuracy would help me to make sure that I hit the target. Sadly, a few years later the school paved over the area we used for our marble casino, meaning that future generations had nowhere to gamble like we had in my day. Also sad is the fact that years later, when I was at college, my father decided to sell my bucket of marbles in a garage sale. I can honestly say that I lost my marbles while at college. The on-line poker world is a little bigger than the one wall at my elementary school, so it’s taking a little longer to become a champion. And the strength and accuracy of my thumb doesn’t help my poker game. But it’s interesting to note that even back then I was having to evaluate risk/reward and that I was playing to win.